We hope you will join us at Chelsea Square for one or several events at General this academic year. Our mission, educating and forming future leaders for the church, is exciting and offers the opportunity for current students, faculty, staff, alumni, and local friends alike to join in our lectures, colloquia and workshops. In response to many requests, today, Tuesday February 5, the Paddock Lectures planning committee determined a way to include an additional 25 seats in the overflow simulcast room. These tickets are available until they sell out on Eventbrite. Live seating in the chapel remains sold out since December 22, 2018, five days after tickets were publicly released. General Seminary’s annual Paddock Lectures, in conjunction with convocation and conferral of honorary degrees to Rowan Williams, former Archbishop of Canterbury and Michael Curry, Presiding Bishop of The Episcopal Church. No registration is required for colloquia. See you there! Register for Quiet Day by clicking on image. A one day conference for clergy, seminarians and others who minister to the spiritual well-being of trans* individuals and their families. Dr. Lou Himes (they/them) is a clinical psychologist who founded QuIPP (Queer Identities Psychology Partnership), a psychotherapy practice focused on providing competent mental health care to trans* and queer communities. Joan Rater (she/her) and Tony Phelan (he/him) are an award-winning television writing and producing team (Grey’s Anatomy, Madame Secretary) whose commitment to transgender visibility in television is inspired by their experience as parents of a trans* son. Austen Hartke (he/him) is the author of Transforming: e Bible and the Lives of Transgender Christians and the creator of the YouTube series Transgender and Christian, which seeks to understand, interpret, and share parts of the Bible that relate to gender identity and the lives of transgender individuals. Rabbi Jo Hirschman (she/her) is a certi ed CPE educator who oversees spiritual care at the Center for Transgender Medicine and Surgery in Mount Sinai Hospital in New York City. Dr. Barbara E. Warren (she/her) is the director of LGBT Programs and Policies in the Office for Diversity and Inclusion at Mount Sinai Health System and also the Assistant Professor of Medical Education, Icahn School of Medicine at Mount Sinai. Below are the approved images for promotion of TransLucent. Please feel free to share and print at your school, place of worship, or organization. General Seminary’s annual Paddock Lectures, in conjunction with Convocation and the conferral of honorary degrees to Rowan Williams, former Archbishop of Canterbury and Michael Curry, Presiding Bishop of The Episcopal Church. In 1974, the 23-year-old graduate student Rowan Williams travelled to General Seminary in New York City for his first lecture overseas in the United States. 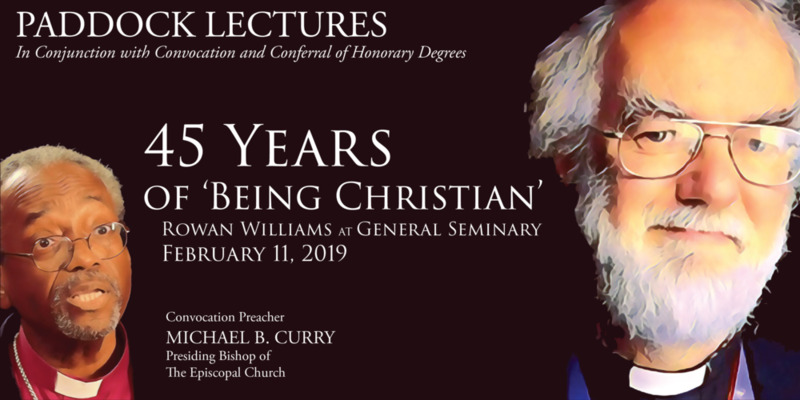 Through the next 45 years, Williams has visited the seminary several times as priest, professor, and Archbishop of Canterbury, and returns to Chelsea Square on February 11, 2019. The former Archbishop of Canterbury will lead “45 Years of ‘Being Christian’: Rowan Williams at General Seminary” in the seminary’s annual Paddock Lectures. The lectures will feature his bestselling catechetical work, “Being Christian: Baptism, Bible, Eucharist, Prayer” in addition to his reflections on a life of ministry, academia, and ecclesiastical leadership. Following the Paddock Lectures on Monday, the seminary will host Convocation in the historic Chapel of the Good Shepherd, which will include the conferral of honorary degrees on Williams as well as Michael B. Curry, the Presiding Bishop and Primate of The Episcopal Church. Curry will preach the homily during the service. Lecture 1: 10:30 a.m. – 12:00 p.m.
Lecture 2: 2:30 p.m. – 4:00 p.m. The event registration fee is $75, which includes admission to all of the day’s activities, including lunch and the reception following convocation. The rate for alumni of General Seminary is $50. As is the custom, the fee for currently matriculated students, faculty, and staff is waived when registered by December 20, 2018. Tell your friends you’re going and tag your travel and the event with #RowanAtGeneral on Facebook, Twitter, and Instagram. Bringing friends and groups from your parish? Use some of our promotional material found below. We have printable posters and digital images you may use on your diocesan or parish newsletter or website.